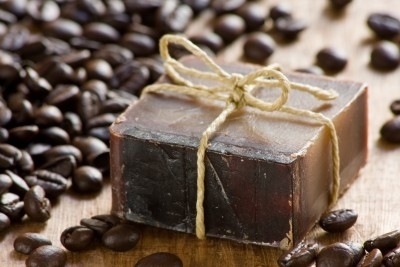 Coffee Soap is brimming with ceaseless skin benefits at SpaFetish®! This organic soap combines the best of two worlds: It is a completely natural soap to cleanse the skin without harsh chemicals, and it's also a highly nutritious soap that is loaded with caffeine and rich in EGCG – a naturally occurring antioxidant that helps to combat free radicals which prematurely age and damage the skin. And, whether you indulge in our regular Coffee Soap, Mocha Soap, or our Espresso Soap, each of these handmade natural soap bars is freshly brewed and packed with Fair Trade Coffee Grounds to exfoliate and renew withered skin. We also add a generous dose of Vitamins A, C, D & E, plus Echinacea and Goldenseal to render an extra dose of whole nutrition. And, just like a venti cup of java (served up by your favorite barista at your local coffeehouse) we encourage you to start off each day with our freshly brewed Coffee Soap. Because, in the world of natural soap bars, you can be sure that SpaFetish® Coffee Soap is the best brew for clean and naturally beautiful skin! Here, our rich lathering shea butter soap is imbued with Fair Trade Vienna Roast Coffee -- to render an uplifting coffee soap that is made all the more striking with a generous sprinkling of freshly ground espresso. A Bestseller! 5 oz. A gratis shower puff sponge is included. In this freshly brewed coffee soap, organic cocoa pairs beautifully with Fair Trade Coffee to render a bracing coffee soap that lends itself well to your home spa ritual. A Bestseller! 5 oz. A gratis shower puff sponge is included.